Building raised garden beds, is a smart, efficient way to improve crops, reduce time in the garden and increase your enjoyment. Raised garden beds have so many advantages to you the gardener and your produce too. Here is how we built ours and why we did! Raised garden beds are easy to sit on for planting, weeding and hand picking pests. We have gardened on our property for 28 years in the far northwestern, temperate corner of Washington state. We are the mossy muddies, whose saturated, heavy soil garden lies under water late into spring in wet clay muck! Until we put in raised beds our garden was unapproachable until late April and often not planted until May. That is late for the Pacific Northwest (we live in USDA garden zone 8a). Many in our area already have early crops up by the time we plant our seed. Our seven acre property is all heavy clay soil. We have slippery, slimy, compacted low nutrient earth. It’s very frustrating when the rains deluge us for months and drowns our crops due to our undrained soil. What’s a gardener to do? It took us a long time to properly answer that question! We have finally found our solution to many of our gardening woes. Our gravel walks make weed control around the raised beds SO much easier! Building raised garden beds is well worth the initial investment of time and money. After decades of fighting our unmanageable garden on the cheap with poor results, Dave decided to build some raised beds. Once Dave built them and we experienced a year or two of gardening with raised beds we are totally sold on them! We have four large raised beds in the outdoor garden of about 4 1/2 x 25 feet x about 20 inches high. In the greenhouse we have one raised bed 24 x 4 with two smaller beds attached to its side for better sun gain and access to the plants and weeds! All of our beds are 20 to 24 inches high with a wide lip. Makes weeding a cinch! Dave in the Greenhouse with his volunteer nasturtium that loves growing up his Double tomato trellis. Building Raised garden beds has freed us from garden labor in many ways. We added four large raised beds into our outdoor garden. Find a way to put them into your garden plot; be it a patio or a large garden area. They have numerous advantages and can look absolutely stunning! 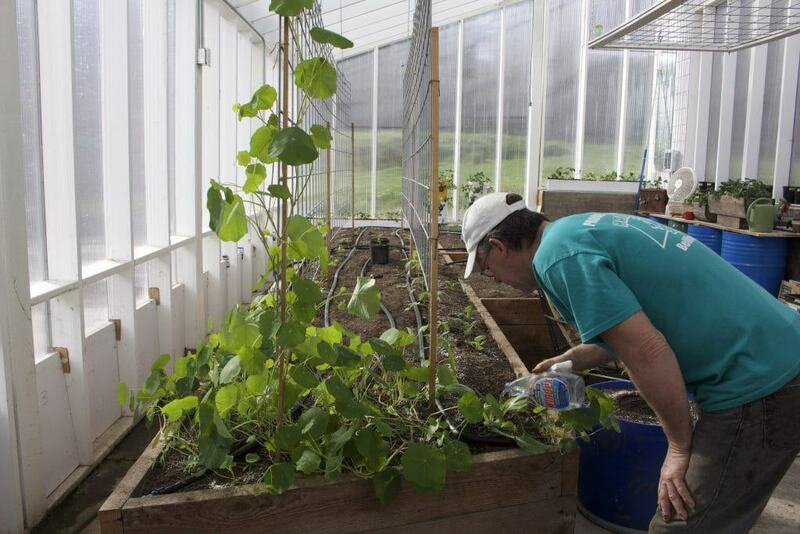 Dave enjoys the ease of working our raised beds in our greenhouse and outdoor garden. He made the beds out of rough sawn 2 x 6 planks he had laying around in our barn. Those raised beds are excellent back savers if you make them high enough. Sit on the bed lip or pull up a chair! In our outdoor garden Dave used old free floor joists, planks and other wooden odds and ends. We lined our beds in plastic to keep any toxins out of our soil. Building raised garden beds really shapes up a garden! Build raised garden beds in a place that gets the light and water you need and is close enough to your kitchen to be somewhat convenient for you, if possible. 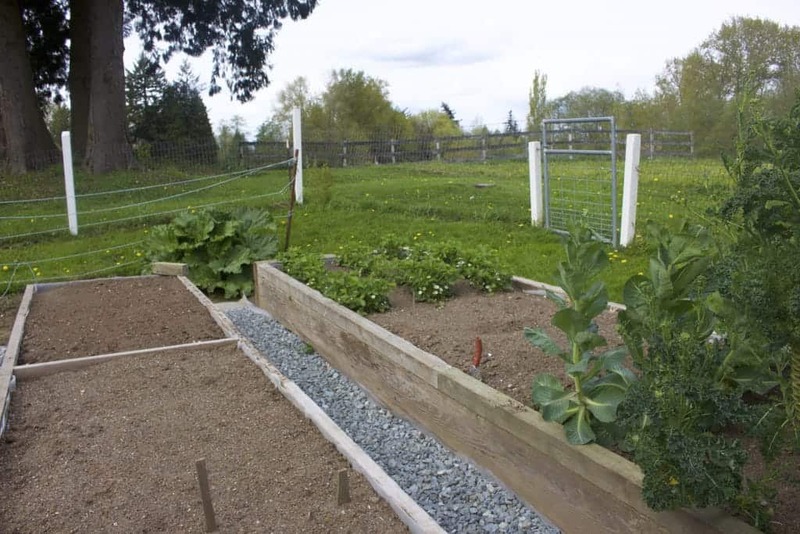 Consider square foot gardening in raised beds for at least part of your garden. We use Lasagna Gardening for our lower garden and start the crops much later. I PROMISE raised beds will save you astounding amounts of time and money in the long run. Here are a few reasons why. 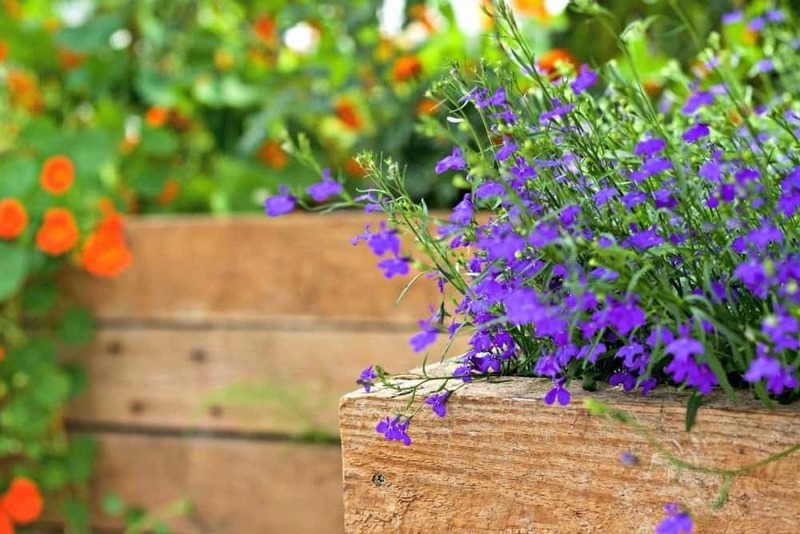 The beauty and advantages of a garden in distinct, raised beds are many! Raised beds help us economize, get efficient and control the soil. Before we put in the raised beds we would have to amend the entire garden’s soil, rototill it, make rows and walkways and plant. Now we can focus our energy and pennies into concentrated growing areas. 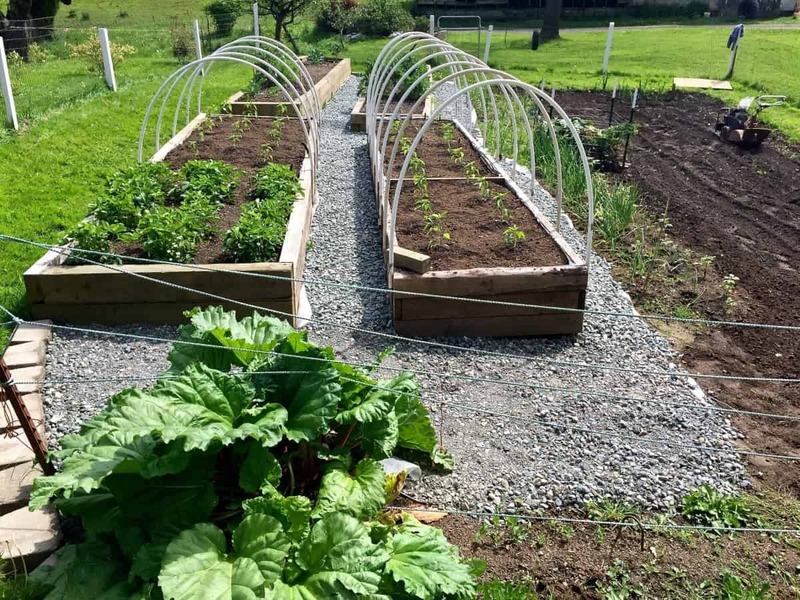 Keeping your soil properly amended in a raised bed is much easier and less expensive than digging soil amendments and compost into an entire garden plot. Do NOT waste your time, energy and money walking all over expensive soil improvements where you don’t need them. Raised beds have good, loamy, well areated soil that hold onto the water and drains it through slowly, retaining the goodness of the soil. This benefits plant roots greatly as they easily absorb nutrients and water in these conditions. OUR relentless Winter and spring rains leach the beneficial nutrients out of the ground beds. With no drainage, the water just pools and runs off leaving hard, cracked lifeless dirt. Raised beds allow much better drainage. 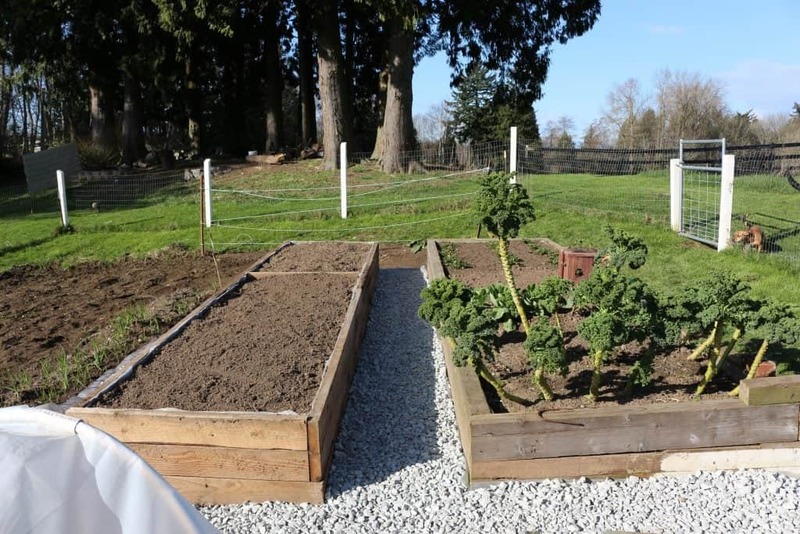 Raised beds get warmer faster in the spring and absorb more heat in the winter. We have noticed a huge difference in our planting schedule in our raised beds. In May we can now harvest cool weather greens from our raised beds and plant carrots, broccoli, baby bok choy, mustard greens, kale, asian greens, arugula, celery, kolhrabi, strawberries, even cabbage and cauliflower. That was Never an option for us in the cold clay ground beds but all of those crops, and our asparagus, flourish in the raised beds, even in early spring. We hoop our raised beds and use plastic sheeting to give the crops protection from the cold too. We group our crops closely together for maximum square foot garden yield. Close plantings in a raised beds work together wonderfully. Companion plantings are easily managed as well. We have protected growing areas for our vegetables and flowers, safe from big, and little, feet. Winter gardening with hoops works well in raised beds. Our first winter Hooped garden with raised garden beds. Raised beds provide a convenient way to garden without getting down onto our wet, compacted, dirt on our knees or breaking our back. We can just sit on the edge of our beds to weed, harvest and manage the crops. Much nicer! We use the boards we have on hand. Get your lumber as cheap as possible but remember to be careful it’s not toxic wood. It all leaches into your soil and produce. Line the bed with plastic if you’re not sure. Raised Beds are MUCH easier to weed. We basically gave up weeding our garden plot by hand and fighting around weeds to harvest our crops. Lasagna gardening and Raised garden beds are both REALLY helpful in reducing weed work. As a final touch and fantastic weed reducer do this step too! Around and in between your raised beds make the ground level. Then add a strip of landscape fabric and pour gravel on it for a great walkway that will be very useful and weed free. Graveled walkways between raised garden beds makes walking, wheelbarrowing and tending your beds a dream! We are into cheap and functional whenever possible in all things, especially the garden. There are some really lovely raised beds ideas and plans out there. Use what you have. We have seen them made of metal roofing panels, wood boards (our method here) and concrete blocks. It all works. If you want something artistic by all means look around the net or your local library. There are so many great ideas out there. Here’s how we approach the project! For practical ease of use a bed about four feet wide is often easiest to actually work in. To determine your width imagine yourself sitting on the edge and weeding into the middle of the bed. That is your halfway mark so double the bed width from there. Also remember to leave adequate room around the perimeter to handle walking, wheelbarrows, gate swings and whatever else may need to be close to it. Figure out how high you will want the beds. 18 to 24 inches is recommended for proper deep root growth but you can choose whatever height you like according to your circumstances and what you plan to grow. We love our 20 inch high beds made of big planks we scored for free. You can grow anything in those beds and they can hold the weight of the dirt! the boards will sit upon with a shovel, rake and hoe. OR build the bed first and shim it to level later. We have done both methods. Whatever is easiest for you is fine. You’re not building a piano! Find or purchase boards of sufficient strength and width to contain the weight of the soil you are using and support you as you sit or stand on the bed edges while you work or visit! 4x 4 inch diameter or bigger is best but for small beds 2 x 6 or larger may work. NOTE: pressure treated boards are toxic and will leach chemicals into your soil. LINE your raised garden beds with plastic if you use them to protect your crops from chemical contamination. by cutting the boards to the length you need and screwing the boards together. Stagger the lengthwise joints if you have any to provide extra strength to the sidewalls. Dave swears by his [easyazon_link identifier=”B00IJ0ALYS” locale=”US” tag=”homefoodjunk-20″]impact driver[/easyazon_link]and [easyazon_link identifier=”B01M0V9WH9″ locale=”US” tag=”homefoodjunk-20″]star headed screws[/easyazon_link] for holding together big heavy boards. These heads do not strip out so much. Choose a good screw for the type of boards you are using. Remember these beds hold a lot of weight in dirt and need to be strongly built! and set your bottom boards level to each other and the ground. Use shims as necessary. We used old bricks to shim our boards for this bed. Our garden is sloped so we need to build up to level our beds. to make the perfect square beds. Put the square on the top of each wood corner and make sure they have a good square fit so they easily fasten together! and nail to the boards underneath and at the corners. If you are using different size boards as we did this time it can be challenging to match it all up well! Stagger your joints as you go up. This keeps the beds strong. If necessary, reinforce the bed sides and inside corners of the wood joins by screwing in additional support pieces. Dave swears by his [easyazon_link identifier=”B00IJ0ALYS” locale=”US” tag=”homefoodjunk-20″]impact driver[/easyazon_link]and [easyazon_link identifier=”B01M0V9WH9″ locale=”US” tag=”homefoodjunk-20″]star headed screws[/easyazon_link] for holding together big heavy boards. These heads do not strip out so much. Choose a good screw for the type of boards you are using. Remember these beds hold a lot of weight in dirt and need to be strongly built. NOTE: THESE ARE GENERAL INSTRUCTIONS OFFERED TO GIVE YOU THE IDEA OF WHAT’S INVOLVED WHEN CONSIDERING THIS PROJECT. IF YOUR HANDY HAVE AT IT, IF NOT, GET SOME HELP. Raised garden beds make great containers for companion plants. If you feel overwhelmed by Building raised garden beds try to find someone who will do the labor for you and possibly barter for future produce. Building Raised Garden Beds is really worth the effort! Happy Planting! Our garden in spring 2015. Dave is hooping a couple of our raised beds to grow his peppers. Look at that lovely graveled walk surrounding our fantastic raised beds! Building raised garden beds is worth it! 2017 Garden. Lasagna Gardening in the lower garden for bushy root crops, beans, squash and corn. Raised beds in the top of the garden for tomatoes, peppers, broccoli, cauliflower, cabbage and leafy crops. The hoops and trellises are easy to use with the raised beds too.